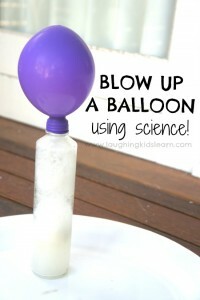 Here is a super simple science experiment that teaches children about clouds and rain. 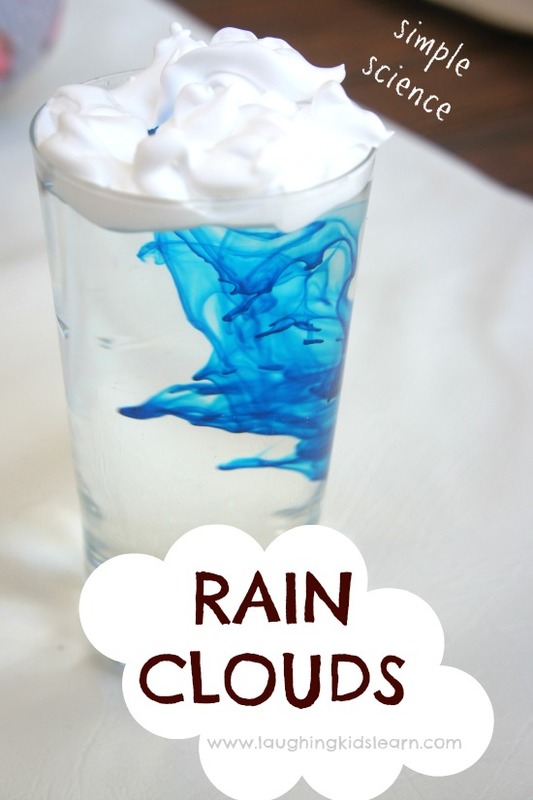 It’s great fun to do at home or in the classroom and this rain cloud science experiment only uses commonly found ingredients. The weather is changing where we live and we are seeing a lot more clouds appearing and rain falling. 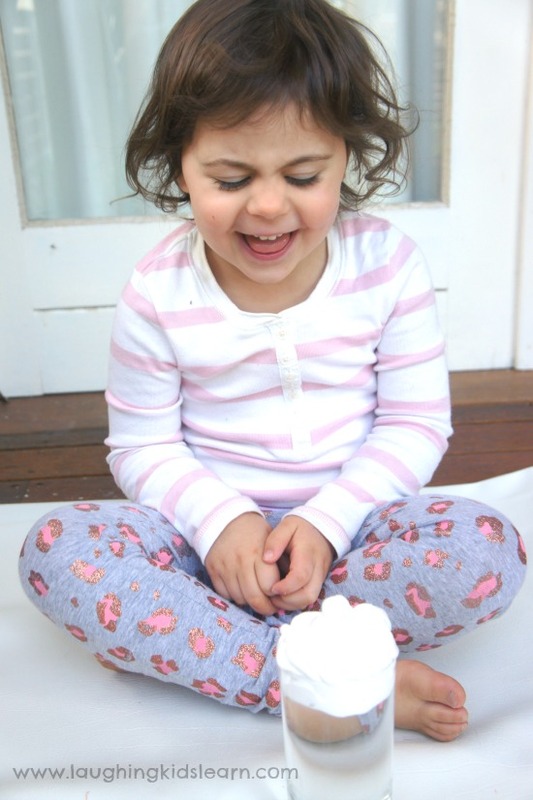 I often find myself focusing my daughter Possum’s (aged 3.5 years) attention to the clouds because they never appear the same and always interesting. We talk often about the shape and size of clouds and how they vary in shades of grey. These commonly occurring conversation led us to learning more about clouds and how it is that rain can fall from them. 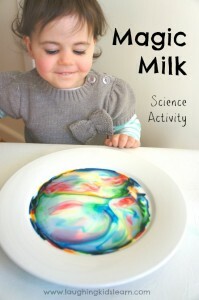 I remember coming across a fun little science experiment while adding various pins to my Pinterest account. Super simple and using only a few commonly found ingredients, I knew we had to give it a go. It might just explain the concept of rain as a visual representation. Simply begin by asking your child to pour water into the glass, leaving about an inch from the rim. 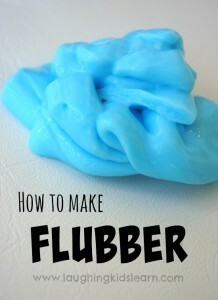 Carefully add a layer of shaving cream to the water. Be sure not to make it too thick or you’ll find you’re having to wait a long time for the magic to begin and that’s a bit boring. 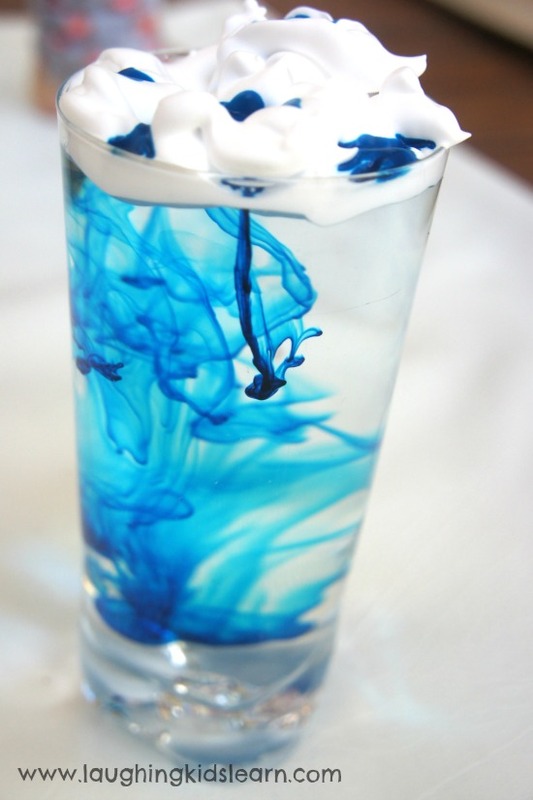 The shaving cream represents a cloud and the water is the atmosphere. 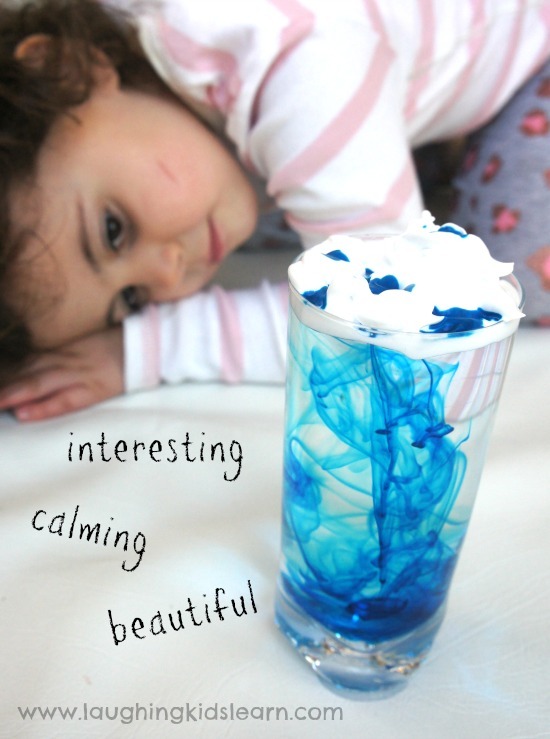 Simply add a few drops of blue food colouring to the shaving cream. 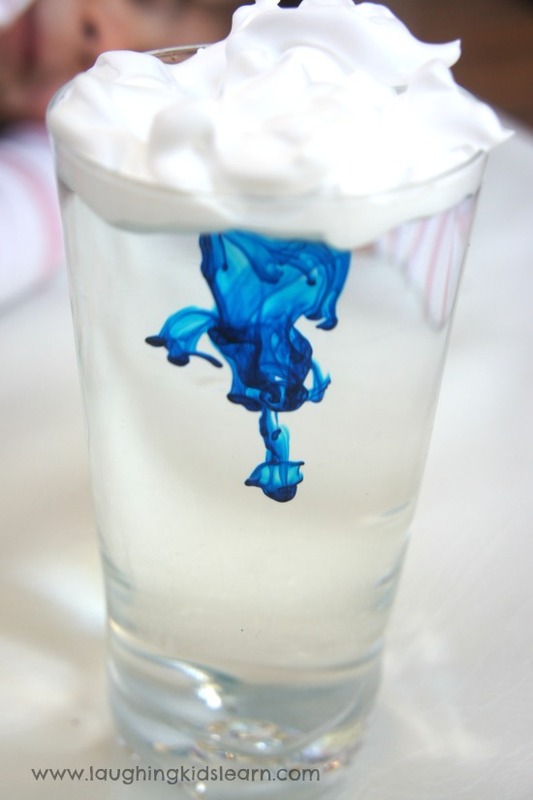 The weight of the food colouring will start to push through the shaving cream and fall down through the water that’s in the glass! This will look just like streaks of rain falling. Gorgeous. 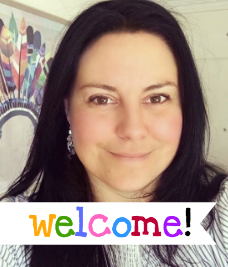 For some children the concept is possibly too complicated, which is absolutely fine, but if you explain it using simple and familiar language they might just be able to make a connection between what is happening in the experiment to what they see in their own environment. I chose to conduct this experiment outdoors so I could directly point to some of the clouds outside. I explained that the darker grey clouds were heavy with water droplets or rain (the food colouring) and that soon enough it would break free and begin falling to the ground, much like we could see in the experiment. Possum absolutely loved watching the streams of blue food colouring fall like droplets through the shaving cream and then swirl around the water. She was inspired to ask lots of great questions but also found it a lovely and calming experience. 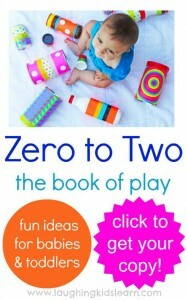 Hopefully you get a chance to have a go at this experiment with the little ones in your life. I really hope they enjoy it. 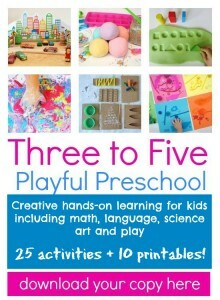 How old are your children and would they enjoy this? You named your child possum….. This is so cool . I am 10 years old and loved doing this . I have done this for my home work and I am proud.thanks for the support. ok, this is perfect! I know some of my kiddos in the clinic (paed OT) would love to do this – this week! (and my son too!) Thanks for the inspiration! The little guys love anything with water. This is great. Totally agree with you. Thanks Kev. We are using it his for our science fair experiment and have lots of fun watching the food colouring react to the shaving cream.Thank you LAUGHING KIDS LEARN. Could you use whipped cream or ‘cool whip’ instead of shaving cream with the same results? Can you use plastic clear cups for this activity? Absolutely Cindy! Have fun with this idea.